Naturally many wonder, why was warming interrupted from about 1940 to 1975, only to resume with a vengeance about 1975? There are two answers. Second: the 1940-1975 time period experienced anthropogenic global cooling. This cooling was from the same root cause as volcanic cooling, namely aerosols (mostly sulfate aerosols) in the atmosphere. Whereas volcanic eruptions are natural, and often inject aerosols into the stratosphere (the upper layer of earth’s atmosphere), aerosols from industrial activity are man-made and almost entirely in the troposphere (the lower layer of earth’s atmosphere, where most of our weather takes place). Because volcanic aerosols can reach the stratosphere, they hang around much longer than man-made aerosols. It takes a couple of years for most of the aerosols from a large volcanic eruption to settle out of the air, so their cooling effect likewise lasts a couple of years. This has been observed with great precision, especially during the most recent eruption with major climate impact, the explosion of the Mt. Pinatubo volcano in 1992. Man-made aerosol emissions don’t last nearly so long. Confined to the troposphere, they settle out of the atmosphere in a matter of weeks to months, so in order to have a sustained climate impact there must be sustained emissions. But, that’s one of the hallmarks of human industrial activity: sustained emissions. Therefore anthropogenic tropospheric aerosols are a consistent feature of earth’s 20th- and 21st-century atmosphere. Those who want to deny the reality of global warming will use any excuse to create doubt about our understanding of recent climate change. The mid-20th-century warming pause is one of their favorite excuses, and even when its cause is explained to them they still dispute it. The question is valid: were sulfate aerosols really that much higher during the 20th century than before the industrial revolution? Where’s the data? There are a number of estimates of sulfate emissions during the industrial era, including this review from Pacific Northwest National Laboratories. They find (as do previous studies) rapid increase in sulfate emissions from mid-century until about 1975-1980, followed by a decline in emissions. A decline of sulfate emissions is soon followed by a decline in atmospheric concentration because they settle out of the air so quickly — unlike carbon dioxide, for which an increase tends to last hundreds of years even after emissions cease. The graph of the atmospheric concentration of sulfates over the last two thousand years resembles — what’s that shape like? — oh yeah! A hockey stick. The agreement is pretty good. To the question: were sulfate aerosols really that much higher during the 20th century than before the industrial revolution? The answer is: definitely yes. To the question: did sulfate emissions really level off, even decline, around 1975? The answer is: definitely yes. I follow most of what you’re saying, but does the change in sulfate concentration account for the observed magnitude of mid-century cooling? I assume there’s enough evidence to estimate the influence of sulfate concentrations on heat flux thanks to all of the eruptions on record. Theres a horrendous spelling mistake in yout title. Is there any guidance or best practice available for converting the depths to age, using the supplied chronologies? And in a completely unrelated question, what is the best smoothing method to use on data that isn’t evenly sampled? And returning on topic: this post highlighted for me the fact that we really haven’t cleaned up our air much at all. I was under the delusion that aerosols had decreased a lot since the 70s. Yes, it gave me a bit of a shock to see the graph. An ‘eyeball’ extrapolation of the GISS graph suggests to me that the current sulphate load is suppressing perhaps 0.5K of warming. That is not a particularly happy thought, since the implication is that action to stop emissions (to raise my personal issue, replacing coal power with nuclear) would cause a large and very rapid temperature increase. A nice account of the “pause.” Thanks, Tamino. It is certainly true that this idea, um, “recurs” a lot among those who think that the mainstream science holds ONLY the forcings due to GHGs to be significant climate drivers. OK if I add this as a quote or a in the article? Or is there a more primary source that I should refer to instead? Tamino, thank you for doing this straight-forward analysis. It appears to me there’s still some piece missing. 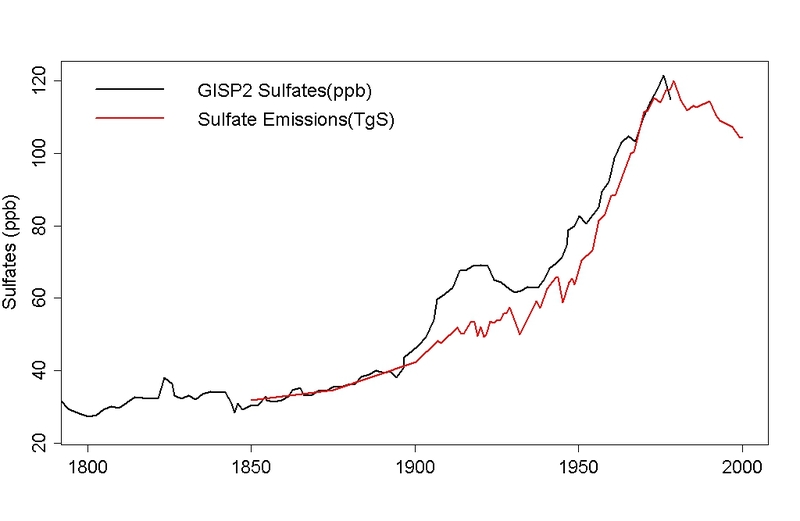 Just eyeballing the graphs, it appears present-day sulfate emissions are roughly equivalent to the 1960’s level. If the cooling from 1940 to 1975 was due (mainly) to aerosols, I would expect then that we would still be experiencing cooling, roughly equal to the 1960s, but certainly not warming faster than the pre-1940 era (when there was less volcanic activity, more active sun etc). Are the aerosols emitted today different in some fundamental way? If I’m reading the chart correctly, aerosol forcing (the non-volcanic kind) did not level off until 1991. Assuming that radiative forcing due to aerosols did not level off in 1975, then why did temps take off then? I’m missing something obvious here, but for the life of me I can’t figure out what that is. KenM, the chart needs careful reading. It assumes constant aerosol forcing after 1990. 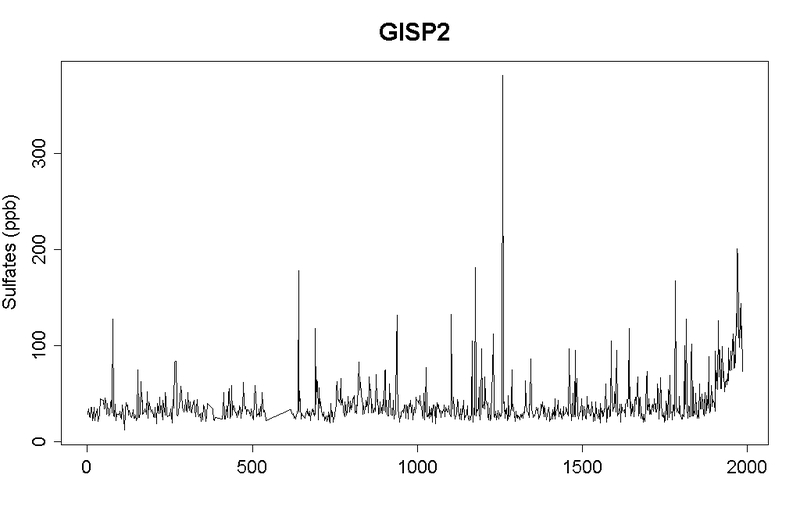 Earlier values are interpolated from model output from a previous study. I can’t help but observe that the ice core data validates none of the datasets. “If I’m reading the chart correctly, aerosol forcing (the non-volcanic kind) did not level off until 1991. 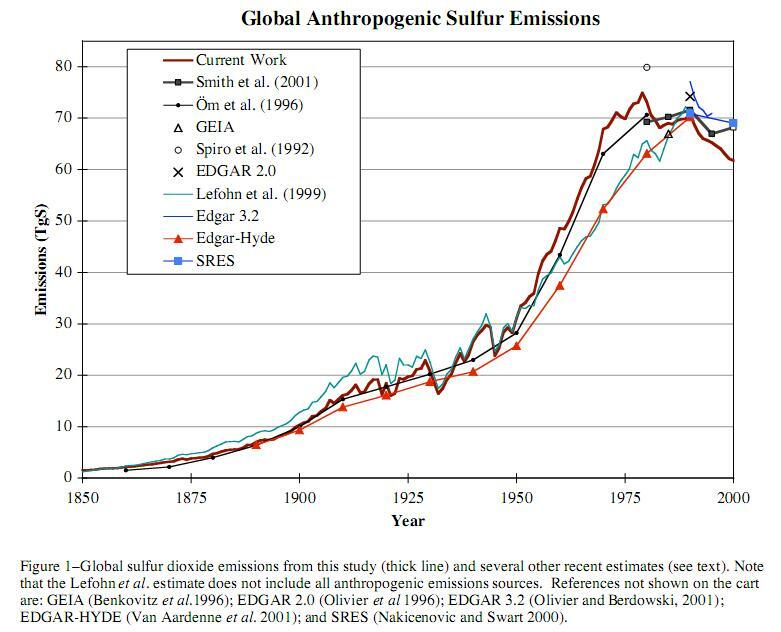 See Tamino’s 2nd figure Global Anthropogenic Sulfur Emissions; note the leveling off of emissions after 1975. Then compare to the Atmospheric CO2 measurents from the Mauna Loa Observatory; note no such leveling off of CO2 emissions. Around 1975, pollution controls removed the sulfate aerosol brake from the CO2 freight train, which is careening out of control at more than 2 PPM increase per year (and the rate of increase is rising). Missing the point, Daniel. Some sources disagree about the profile of sulphate emissions. See Tamino’s 2nd figure, and this time look at all the individual lines. Note that the “current work” line is not an average, it is a new study. Observe that three of the studies show no decline at all, and it is questionable whether they are levelling off (they certainly aren’t levelling off in 1975). These three are long term studies, unlike the short term studies used to infer the “decline”. Tegen et al (2000) is another study that disagrees with the PNNL study. The paint’s not dry on this one. Now I look closer, Tamino has made one error. He has treated the “current work” as a review. It is not, it was a new inventory produced by the US DoE during the Bush administration. Which study is most reliable? I have no way of knowing. How about those high atmosphere nuke tests, that ended sometime, did them hav some effect? It’s my understanding that minimum overnight low temperatures continued to increase right through the 1940-1975 “anthropogenic cooling” period. This would be consistent with greenhouse gas forcing, even with the aerosol masking. When the citizens of China and India become more Westernized and then begin demanding clean air legislation, global warming will really take off. Ironic that pollution is “helping” us in that respect. My understanding is that this is underway now, to an extent–Beijing’s air is of course notorious, and there was considerable embarrassment around that during the Olympics as a result. That “showcased” the issue. Also, I think that’s supposed to be one of the factors leading to high growth rates in renewables, in both countries. The temperature data for Los Angeles looks much more like the Southern Hemisphere data than the Northern. I would think that LA would be a poster child for aerosol cooling but it is not. Why? Because LA was infamous for pollution? In fact its pollution was a particular kind, photochemical smog: it was not the aerosols Tamino is referring to. You are deluding yourself if you think that none of LA’s pollution is composed of sulfates. Perhaps I should have been clearer. What made LA a special case, special enough for you to use it? LA is not a “special” case. I used it because when I saw the separate Northern and Southern Hemisphere series, it struck me that LA looks more like the SH. So as to not single out LA, Paris also looks more like the SH – no 1940-1975 cooling. To know for sure either way about whether or not LA’s smog included high levels of suphates, you’d first have to know the typical sulphur levels in Southern Californian octane in the mid-1970s. I’m not saying either of you is right or wrong about sulphate levels in the smog; just that if LA used low sulphur petrol back then they might be lower than you’d expect. Hi word out, the Ain’t Truthospheric Inhabitants will of course put it under the label of Intelligent Design… we can mess and BAU all we want they think. Meantime, per Cryosphere, the Global Sea Ice Area fell by over 1 million km in a matter of about 5 days. JAXA and the detail pic posted at Rabett’s is hinting at the Beaufort out MYI ring that was keeping the extent up is going… betting now on 3rd lowest for sure and 2nd lowest possible… don’t want to think of worse. I do sometimes wonder if sulfate emissions have increased again in the last 5 years due to the China boom. Charts on Co2 emissions show China dramatically taking off in the last decade to be the number one emitter in the world. Is current Chinese industry as prodigious a sulfate generator as western industry was in the 50s and 60s? However, current Chinese emissions are comparable to peak US/UK emissions. And I would expect this to rise. China is adding enormous amounts of electrical generation capacity to its grid, and mostly from coal. I’ve seen one of these (smaller) plants and it literally consists of men shoveling coal into an open fire. Clean energy projects (including clean coal) are getting a lot of hype over there, but they’re not even close to compensating for the massive industrialization build out. And this with China’s energy consumption already close to the US. From the data in this post it seems like uncontrolled fossil fuel burning is actually a net global coolant due to the sulfates, so it seems that this would act as a break on CO2 based warming effects. Regarding China, anyone thinking that any progress is being made on emissions should see this horror story.. 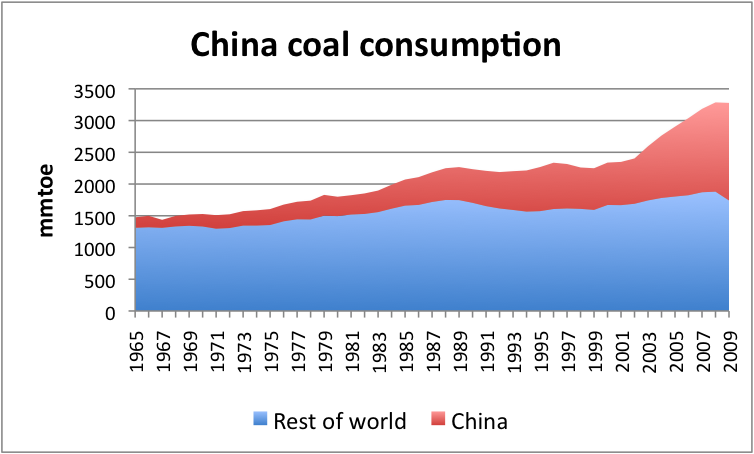 Yes, world coal consumption has gone up 30-odd percent since the year 2000. Much of the increase being in new power stations with an expected 50+ year life. On the plus side, even the most raving die-hard skeptic is going to have all the evidence they need for global warming. On the minus side, even the most raving die-hard skeptic is going to have all the evidence they need for global warming. PNNL has released a sulfate emissions data set updated through 2005. The paper may be found here. Huh? I don’t follow this. The latest IJIS value as I write (ie., the data for 8/23/2010) is 5,598,594 km2; the closest value to the 800,000 plus occurred on 8/8/2010: 6,402,500. That’s 15 days. Other data source? Other metric? Prophecy? Please expand/explain. Here’s a short and sweet paper outlining the way GHG warming and aerosol cooling have interacted, and how they’re projected to interact in the future. In a previous post, Ray Ladbury directed me to the following link that shows a fairly constant increase in negative forcing from sulfate aerosols from 1940 through at least the mid-1990s. Also, the Greenland ice core data do agree pretty good with sulfate emissions estimates, but Greenland is located downwind of the US and Canada and does not represent global trends impacted by developing countries. The “interruption” has interested me ever since I became aware of climate change (of any kind) but I have a couple of questions. Looking at this, why do you say the earlier warming episode started in 1915? It looks much more like 1910 to me. But my real question is about the 1940-75 interruption. This looks to me like a very rapid drop 1942-50 following an equally rapid rise 1935-40. We then had a very slow rise to the mid 70s. What was going on in the late 30s, and why would anthro-aerosols cause such a rapid drop from 1942? Am I just guilty of reading too much into short-term trends? I don’t consider myself an expert by any means, but industry was doing quite well during the 1920s — and then of course this was followed by the Great Depression but then by the late 1930s (1937-9) you had the build-up to war that included US aid to Great Britain. So with the 1920s I would expect sulfates and nitrates to counterbalance warming due to greenhouse gases (although methane was the bigger player back then) and there should have been little if any warming. Then during the 1930s I would expect sulfates to quickly drop out of the atmosphere due to severe economic decline. Greenhouse gases would have remained in the air though with methane having a residence time of about 10 years. But with the build-up to war economic output reflective aerosols would have been at a higher level — with greenhouse gases having gone stagnant for a good part of the previous decade and with methane having been hit even harder due to its short residence time. So the warming trend should have come to an end — as we saw. The only thing that really surprises me is that we didn’t see a peak cooling rate until the end of World War II. But basically greenhouse gases give the system a fair amount of inertia and what matters is more or less cumulative output. But with tropospheric aerosols you have a very short residence time — roughly two weeks. It would seem that before pollution laws really take effect, assuming constant economic growth, both the rate CO2 output and cumulative CO2 grow exponentially — but so do is the rate of reflective tropospheric aerosol emission — and the effects roughly cancel one-another. But during times of recession aerosols fall out, greenhouse gases remain in the atmosphere and heat is accumulated due to net positive forcing. However during economic rebounds aerosols dominate leading to net negative forcing. Its possible that biases due to measuring temps with Buckets affected temps around 1940. That was a fairly big controversy at the time, but now seems to have been mostly forgotten within the climate blogosphere. And I have no idea whether our current temperature data incorporates the suggested adjustment which reduces the bump around that time. What was going on in the late 30s, and why would anthro-aerosols cause such a rapid drop from 1942? From the 1940s there were 1000 bomber raids over Germany and the sky filled with vapor trails around the stratosphere. 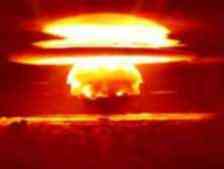 From 1945 onwards there were nuclear explosions in the atmosphere injecting massive quantities of particulates into the stratosphere. While we’re speculating about climate and history, let’s throw in the Dust Bowl, too. Ten-plus years of drought in territory that was past its carrying capacity led to massive dust storms, which reached the East Coast. Two and a half million people (“Okies”, though many came from other places than Oklahoma) ended up displaced. So what’s the climatic effect of massive clouds of dark dust filling wide swathes of the troposphere above central North America and coating the ground beneath? Interesting that the worst Dust bowl years were 33-35, and that 1934 was (of course) the warmest year in the record for the contiguous 48 states. Which was cause, which effect–or was there a feedback loop with warm dry conditions causing drought and erosion leading to dust storms, leading to albedo feedback to further add to the warming? Yes, I’ve long thought there was a feedback there. The dust bowl was kicked off by a drought and poor farming practices, but the temperature extremes were enhanced by albedo feedback. BC’s provided link to that 2009a Cook PDF is having issues at this time. Perhaps the 2009b Cook PDF is an updated version? “Ask and ye shall receive”–thanks, BC! Might I suggest that one of your earlier articles, namely “Not Computer Models 17/08/2009” would be useful to consult in the context of this article? Unfortunately, like many of your previous pearls, it seems to have sunk to the depths of the internet trough and is no longer available, at least as far as I can find. I hope the piggies haven’t eaten it. It’s not often I disagree with Tamino. I’m usually quite hesitant to do so, because I’m no statistician. However, this isn’t a statistical mistake. As I expressed above, not all sulphate studies agree, particularly with respect to recent emissions. 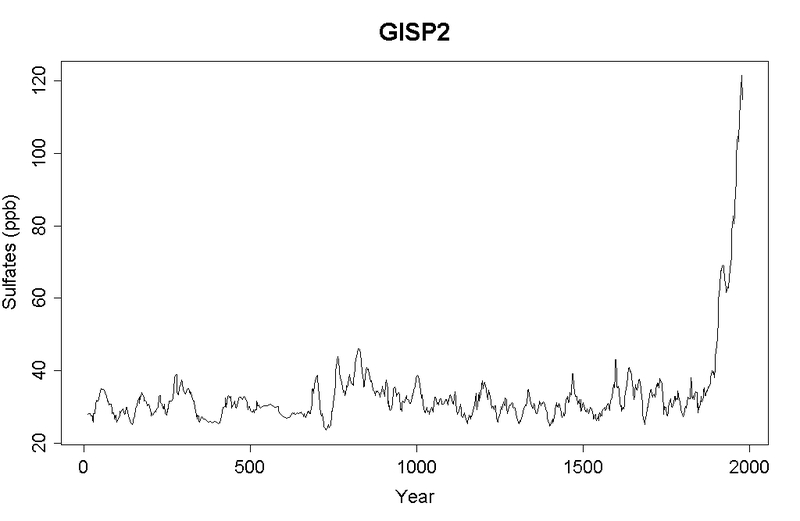 Further, GISS Model-E is run with aerosol forcings that do not level off until 1990. Now, Model-E has a little trouble reproducing the exact character of the 1940-1975 period, but some individual runs are uncannily close. This indicates that the temperature is not particularly sensitive to such small features as when sulphates level off. Therefore, I do not believe the natural variability and chaos in the system, and the accuracy of our observations allow such a strong statement as Tamino’s “definitely yes”. I think the 1975 change is attributable to two things: 1) Greenhouse gas forcings reached sufficient magnitude that they were clearly more dominant than the variability shown in lesser positive and negative forcings. 2) Greenhouse gas forcings reached maximum growth around the same time. I’m not really disagreeing with either one of you. However, if we are concerned with the rate of warming we probably shouldn’t be looking at forcing but rate of change in forcing. Furthermore, if we are trying to explain why the rate of warming went up in say 1975 we don’t want to look at just the rate of change in forcing due to well-mixed greenhouse gases and reflective aerosols by the rate of change in net forcing. And I will say this — around 1975 we went from a fairly healthy mix of pluses and minuses in the rate of change in net forcing to nearly all pluses — with a couple of strings minuses: 1981-2 and 1991-2. Note: emissions are estimated independently of the model, based on chemical analysis of ice core samples from Greenland, industrial production, etc.. Forcing however is dependent upon the climate model, and in the case of aerosols distribution due to atmospheric circulation is estimated independently of the main model itself. The sulfate plot intrigued me, especially that huge spike roughly around 1300 A.D. I did some seeking and found some references to volcanic eruptions that would have produced such spikes. Between 1200 and 1300, there were two eruptions of Katla and one of Hekla (the latter actually dated in the above to July 11, 1300). The winds must have been blowing in the right direction for one of those to cause the big spike. Surprisingly, the double spike just before 1500 is usually attributed to a VEI 6 from the Vanuatu archipelago. But a recent paper indicated that there wasn’t good evidence of a big eruption there at that time. Thanks for the opportunity to post this digression. Off topic I know but Tamino’s plot of Northern and Southern Hemisphere’s temperature anomaly reminded me of something that I have thought about for a while. The reason the plot was the trigger is that the Southern Hemisphere is dominated by ocean much more than the Northern Hemisphere. Could the difference between the land temperature anomaly and ocean temperature anomaly be used to calculate how far away from energy equilibrium the planet is? that describes and points to the method used, among much else. 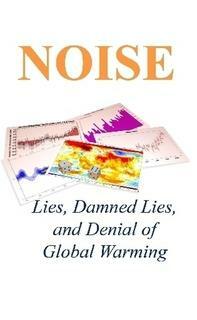 I add in the effect of long term natural variability as crudely measured by the AMO. That index has a bump up in the 1940s followed by a decline to its negative pahse and is once again now in its positive phase. I’m under the impression this gives a rough idea of how quickly heat is removed to the deep ocean. I would be interested to know how widely the sulfate aerosols can disperse. It would seem that as the US emission standards became more stringent and compliance more widespread, countries like China, India, Brazil and others begain to use more coal energy as thier infrastructures expanded. I am assuming that these countries do not have as stringent emission standards or controls. So if even the US decreases our emissions other countries may not. So will these countries sulfate emissions have a local or global affect? This is what frustrates me the US isn’t perfect and we may be the worlds wipping boy at the moment but no other country as gone to the lengths to protect the environment as we have. Fig. 3 suggests that modern countries in North America, Europe, South East Asia, Australia and New-Zealand greatly reduced their sulfur dioxide emission. In contrast developing countries in South and Central America, the Middle East, Africa and India and China greatly increased their sulfur dioxide emission. So much even that the downward trend from 1975 onward turned into an upward trend from 2000 onward, this trend is comparable to the trend observed before 1975. May be this partly explains the slight slowdown in warming during the last decade, this is however uncertain because the sulfur dioxide emission for the last 5 years are not available. Cory Merriman | August 26, 2010 at 2:20 pm — I’m certainly seeing ABC from East Asia here in the inland Pacific Northwest. Cory, have you heard of Europe? A belated correction to the above post. The page referenced should have been the NCAR Earth Observing Laboratory (EOL) page not the NASA EOS page. In your last graph, the sulphate concentration curve stops in about 1980 (I suppose the GISP2 data only goes that far). I was wondering if you could use Mike’s Nature trick of adding in the actual So2 concentrations for the last 3 or 4 decades, so we see what’s happening now. Richard forgive me, but I have heard of Europe and the European union, though I know little of their environmental policies. I merely spoke of the “lengths” we have gone to to protect the environment. Although the US does not have a perfect record and sometimes sweep things under the rug when its an election year… We have implemented some of the most audacious environmental policies the world has seen and have spent billions of dollars doing so. So the lengths we have gone to is more than just words on paper, but also speaks to the shear size of our country and the miracle that we have ever come to a consensus on such legislation as the Clean Water Act, Oil Pollution Act and so on. So Richard I was not meaning to give offence to our European brothers I was only speaking to what I know. I was told by one semi-expert climate scientist (someone who was in the process of changing fields to climate science from a different numerical modeling field, as so possibly still catching up) that although globally aerosols played the most important role in this period, there was also around the same time period (maybe beginning slightly earlier? I’ve forgotten the details) a weaker cooling signal in the Arctic, where aerosol concentrations were low, which is not well understood. Do you know anything about this? I don’t have the article handy, but my recollection is that anomalous meridional flow during this time period led to warm air advection into the arctic (and compensatory cold air advection into the mid-latitudes) which would have ameliorated some of the cooling. The major early 20th century climatic fluctuation (∼1920–1940) has been the subject of scientific enquiry from the time it was detected in the 1920s. The papers of scientists who studied the event first-hand have faded into obscurity but their insights are relevant today. We review this event through a rediscovery of early research and new assessments of the instrumental record. Much of the inter-annual to decadal scale variability in surface air temperature (SAT) anomaly patterns and related ecosystem effects in the Arctic and elsewhere can be attributed to the superposition of leading modes of variability in the atmospheric circulation. Meridional circulation patterns were an important factor in the high latitudes of the North Atlantic during the early climatic fluctuation. Sea surface temperature (SST) anomalies that appeared during this period were congruent with low-frequency variability in the climate system but were themselves most likely the result of anomalous forcing by the atmosphere. The high-resolution data necessary to verify this hypothesis are lacking, but the consistency of multiple lines of evidence provides strong support. Our findings indicate that early climatic fluctuation is best interpreted as a large but random climate excursion imposed on top of the steadily rising global mean temperature associated with anthropogenic forcing. OT, but worth a try at posting: University of Chicago has published videos of its global warming classes on Youtube. Very accessible now. Tamino, are you familiar with Thompson’s Nature paper from 2008? which would have counteracted the aerosol cooling effect. In the opposite transition to rapid warming in 1975, once again I am struck by the fact that while aerosol emissions ceased to rise, they did not disappear entirely from the atmosphere, but began a gradual decline from a high peak. In short, aerosols alone cannot explain these distinct phases of cooling or warming. In 1975 Wallace Broeker (the guy who first used the phrase ‘global warming’, predicted a rapid transition to warming in the 1980s, caused by a combination of rapidly rising CO2 emissions and a natural temperature cycle (derived from work on Greenland ice cores at Camp Century) which showed a rapid warming phase up to 1940, followed by the cooling phase which was attenuated by CO2. Broeker’s work has been largely disregarded in recent years, but I believe we have thrown the baby out with the bath water. 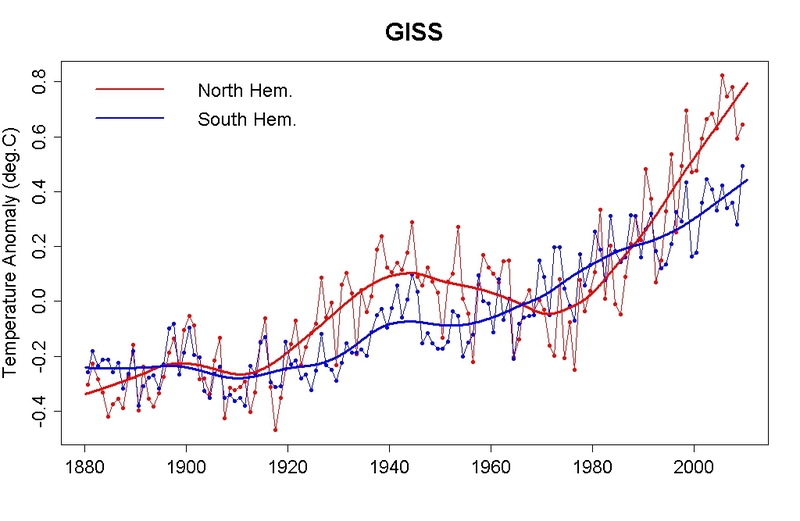 If you use HADCRUT temperature record for the Southern Hemisphere from 1850 it is possible to discern a peak in 1880, 60 years before the 1940 peak, and 120 years before 2000 when the infamous ‘global cooling’ period, 2002-08, kicks in. suggesting the peak of a third 60 year cycle, much attenuated by the CO2 warming. Warming has already begun to accelerate again since 2009. The whole picture becomes very clear if you smooth out the short term cycles with a 15 year running mean. That cuts off most of the 21st century, but the first two peaks are clearly visible. Howeever, part of the brrief cooling following 1945 or so was do to internal variability as measured by the AMO; it started down from a high around then. She referred to the following paper by Duan : http://bprc.osu.edu/Icecore/Duan%20et%20al%20GRL%202007.pdf , in this paper sulphate emissions found in multiple ice cores, from different locations was studied. There is more interesting stuff on glaciers with missing signals that are associated with nuclear testing.